Muscat found themselves limping back to port after a collision on the start line in the final race of the day with Alinghi and Red Bull Sailing Team. The crash, which could be heard by the gathering spectators on shore at the Promenade des Anglais, also left the Austrians out of racing and both teams have a long night of repairs ahead to be back on the water tomorrow. The 15 knots of breeze and gusts that reached 23 knots by the final race combined with a tight start line is what the sailors attributed today’s drama too on the Bay of Angels. 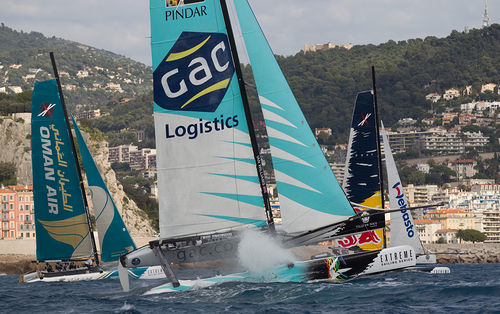 In the final race of the day as the eight Extreme 40s charged to the start line at full pelt, the Swiss team Alinghi careered into The Wave, Muscat resulting in serious damage not only to the Omani boat’s hull but also causing them to smash into the Austrian team Red Bull Sailing Team. The Austrian double Olympic gold medallist Roman Hagara’s team will also be craning out their Extreme 40 Red Bull Sailing Team tonight – and Hagara says missing a day of racing is out of the question. “It was quite a good day for us until that last race. It just came down to one bad race. The boat has a big hole in it and it will be a long night for us as we try to repair the damage. We have to get it fixed by tomorrow, we need to race and we will do everything possible to repair the boat.”Both Red Bull Sailing Team and The Wave, Muscat were awarded average points for the final race they missed, leaving them both in podium places in first and third respectively, while Alinghi were deducted six points. GAC Pindar and SAP Extreme Sailing Team showed moments of real brilliance today both claiming race wins throughout the day currently sitting in fifth and sixth respectively. For three of the fleet, tonight is all about making repairs and getting back on the water tomorrow in time for the penultimate days racing which is due to start at 1300 local time.